April 19, 2019 / Manhattan Neighborhoods / Manhattan Shopping / Manhattan Buzz NYC. Manhattan Street Fairs begin in very late March. 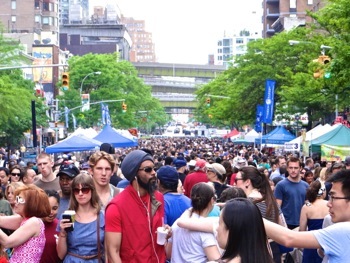 We've compiled one of THE MOST COMPREHENSIVE SCHEDULE of MANHATTAN street fairs including street fair TIMES & PHOTOS & maps, some street fair names & sponsors, and street fair maps to help you find your way around during the spring, summer and fall of 2019. So to look through all of the Manhattan street fairs on a given weekend, you have to look through each neighborhood. Use the Directory below - the links of which take you to each neighborhood - and after you are done looking at one neighborhood, hit the back button, and it will take you back to the Directory, where you can click to the next neighborhood section of the Manhattan - or you can keep scrolling down the page through each neighborhood section. The Manhattan street fair dates that have been updated with 2019 designations reflect the current 2019 St Fair events. Also check our Manhattan Events calendar and / or our Manhattan Farmers Markets section for updates and other things to do. Click here to go to the Midtown Neighborhoods NYC section of this site. Saturday, March 16, 2019 - The St. Patrick's Day Parade begins at 11 am and runs until about 5 pm. The parade begins on 5th Avenue at 44th Street marching north to 79th Street. The parade has never been held on a Sunday, which is officially St. Patrick's Day, as 'Sunday is the holy day of obligation'. But other St. Patrick's Day parades are held on Sunday, including one this weekend in the Park Slope neighborhood of Brooklyn. Saturday, April 6, 2019 - Tartan Day Parade begins at 2 pm Along 6th Avenue at 45th Street, marching north to 55th Street in Midtown. Tartan Day parade in Manhattan. Sunday, April 14, 2019 - The Greek Independence Parade begins at 1.30 pm on 5th Avenue marching north from 64th to 79th Street. Greek Independence Day parade in Manhattan. Street fairs & festivals in Midtown Manhattan NYC. St fairs & festivals in Midtown Manhattan NYC. Sunday, April 14, 2019 - The Persian Day Parade begins at 11 am at 38th Street, marches south along Madison, ending at Madison Square Park at 26th Street [kids / parades / free]. Street fairs & festivals in Midtown Manhattan NYC. Saturday, April 20, 2019 from 10 am - 6 pm. 6th Avenue Herald Square Fair - Along 6th Avenue between 23rd & 32nd streets. St fairs in Midtown Manhattan. Saturday, April 27, 2019 from 11 am - 6 pm - The Sikh Day Parade begins at 11 am at 38th Street and Madison Avenue marching south to Madison Square Park between 23rd & 26th streets where there will be a fair that runs until 6 pm [st fairs]. Organized by the Sikh Cultural Society Org. Street fairs & festivals in Midtown Manhattan NYC. Saturday, April 27, 2019 from 10 am - 6 pm. 8th Avenue Chelsea Spring Fair - Along 8th Avenue between 14th & 23rd streets. St fairs in Chelsea Manhattan. Asterisk* means 2018 fair that has NOT been updated / 2019 Street Fair updates done on a periodic basis. * Friday, May 4, 2018 from 10 am - 6 pm. Grand Central Food Festival Series Fair #1 - Along 43rd Street between Lexington Avenue & 3rd Ave in Midtown Manhattan NYC. Street fairs & festivals in Midtown Manhattan NYC. * Saturday, May 5, 2017 from 10 am - 6 pm. Earth Awareness Day Fair At Herald Square - Along Broadway from 35th Street to 39th Street in Midtown Manhattan NYC. Street fairs & festivals in Midtown Manhattan NYC. * Saturday, May 12, 2018 from 10 am - 6 pm. Times Square Spring Fest - Along Broadway between 47th & 57th streets in Midtown Manhattan NYC. * Sunday, May 13, 2018 from 10 am - 6 pm - Bryant Park Community Fair [Mothers Day] - Along 41st Street between 6th and 7th Avenues in Midtown. Street fairs & festivals in Midtown Manhattan NYC. * Friday, May 18, 2018 from 10 am - 6 pm. Grand Central Food Block Party - Along 43rd Street between Lexington Avenue & 3rd Ave in Midtown Manhattan NYC. Saturday & Sunday, May 18 & & 19, 2019 from 10 am - 6 pm. 9th Avenue International Food Festival - Along 9th Ave between 42nd Street & 57th Street. Click here to view a map of the 9th Ave street fair in Manhattan.M. * Thursday, May 24, 2018 from 10 am - 6 pm. 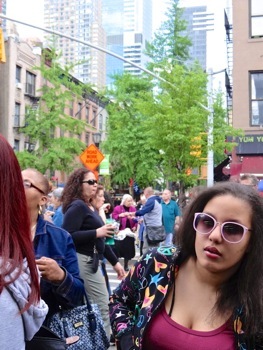 Midtown East Spring Fest - Along 47th Street between 3rd & Lexington Avenues in Midtown Manhattan NYC. * Friday, May 25, 2018 from 10 am - 6 pm. 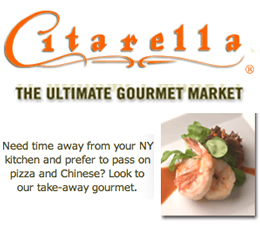 Grand Central Food Fair 2 - Along 43rd Street between Lexington Avenue & 3rd Ave in Midtown Manhattan NYC. * Saturday, May 26, 2018 from 10 am - 6 pm. Midtown West Spring Fair - Along 8th Avenue between 42nd & 50th streets in Midtown Manhattan NYC. * Sunday, May 27, 2018 from 10 am - 6 pm. Lexington Avenue Spring Festival Street Fair - Along Lexington Avenue from 42nd to 57th Street - a street fair in the Manhattan neighborhoods of Midtown & East Side in Manhattan NYC. * Saturday, June 2, 2018 from 10 am - 6 pm. Sixth Avenue Shopping Spectacular - Along 6th Avenue from 42nd Street to 55th St in Midtown Manhattan. * Saturday, June 2, 2018 - 11 am - 6 pm - Murray Hill Neighborhood Festival - Along west side of Park Avenue from 34th to 40th Streets in Midtown NYC. A collaboration with the Murray Hill Neighborhood Association NYC - note 11 am start time. * Sunday, June 3, 2018 - 10 am - 6 pm - Sixth Avenue Springfest - Along 6th Avenue from 34th to 42nd Streets in Midtown NYC. * Sunday, June 3, 2018 - 10 am - 6 pm - Philippine Independence Parade & Fair - Parade begins at noon along Madison Avenue starting at 38th south to 26th Street. St Fair along Madison Square Park between 24th and 26th Streets in Midtown NYC. * Friday, June 8, 2018 from 10 am - 6 pm - East Side Spring Food Fair - Along 43rd Street between Lexington and 3rd Avenue in the Midtown East NYC. * Sunday, June 10, 2018 from 10 am - 6 pm. New York City Expo Street Fair - Along 3rd Avenue from 23rd Street to 34th Street - a Midtown Manhattan Street Fair in NYC. * Saturday, June 23, 2018 from 10 am - 6 pm - 41st Street Festival - Along 41st Street between Broadway & 6th Avenue in Midtown Manhattan. * Friday, June 15, 2018 from 10 am - 6 pm - Grand Central Food Block Party Series - Along 41st Street from 3rd to Lexington Avenue in the Midtown neighborhood of Manhattan. * Sunday, June 17, 2018 from 10 am - 6 pm. Avenue of the Americas Summerfest / Fair - Along 6th Avenue from 42nd Street to 56th St in Midtown Manhattan. Was once called USO Street Fair. * Sunday, June 17, 2018 from 11 am - 6 pm - Taste of Jewish Culture along 6th Avenue between 48th and 49th Streets [food]. This was organized by Workman's Circle. * Thursday, June 21, 2018 from 10 am - 6 pm - Midtown [formerly East Side Craft] Food Fair along 52nd St between 3rd & Lexington Avenue in Midtown Manhattan. * Saturday, June 23, 2018 from 10 am - 4 pm. Turtle Bay Festival Street Fair - Along Lexington Avenue from 42nd Street to 54th Street in Midtown Manhattan NYC. * Friday, June 29, 2018 from 10 am - 6 pm - Upper East Side Food Fair along 54th St between 3rd & Lexington Avenue in Midtown Manhattan. * Saturday, June 30, 2018 from 10 am - 6 pm - Park Avenue Summer Fair - On Park Avenue from 47th to 57th Streets in the Midtown neighborhood of Manhattan. * Sunday, July 15, 2018 from 11 am - 6 pm - Broadway Movie Day Festival - Along Broadway between 47th Street and 57th Street in the Midtown West neighborhood of Manhattan. * Sunday, July 22, 2018 from 10 am - 6 pm. Lexington Avenue Vanderbilt Y Festival - Along Lexington Avenue between 42nd & 51st Streets in the Midtown East Manhattan neighborhood. UPDATES FOR 2ND HALF OF 2019 SEASON COMING by mid July 2019. Also scroll up to see other Neighborhood sections. Asterisk* means 2018 & NOT updated for 2019. WE WILL SWITCH TO 2nd Half 2019 SCHEDULE IN mid July 2019. 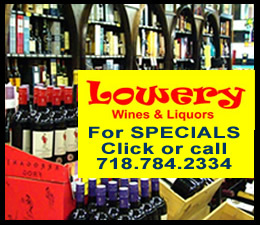 - Click here for our monthly events calendar which is updated weekly - Things To Do Manhattan NYC. Click here to go to the Upper East Side Neighborhood UES section of this site. Saturday, April 13, 2019 from 11 am - 1 pm there's an Easter Egg Hunt at Carl Schurz Park at 86th Street and East End Avenue. Street fairs & festivals on the Upper East Side NYC. * OLD - Sunday, April 15, 2018 from 10 am - 6 pm - 60th Street Central Park Spring Fling - Along 60th Street from 5th to Madison Avenue. Upper East Side street fairs / festivals. * OLD - Sunday, April 22, 2018 from 10 am - 6 pm - Lexington Avenue Festival - Along Lexington Avenue from 60th Street to 66th Street in the Upper East Side neighborhood of of Manhattan. Click here for a map showing the location of the Upper East Side street fair in Manhattan NYC. Saturday, May 11, 2019 from 10 am - 6 pm - MCC / 2nd Ave Community Benefit Festival - Along 2nd Avenue from 66th to 86th St - Upper East Side NYC street fair Manhattan. [Moved from Spring / May to Fall / September last year - this year it's Sept 15, 2019] Third Avenue Community Benefit Festival Street Fair Manhattan - Upper East Side NYC street fairs in Manhattan. * Saturday June 2, 2018 from 10 am - 6 pm - First Avenue Festival Street Fair East Side NYC Manhattan - Along 1st Avenue between 68th Street and 79th Street - Upper East Side NYC street fair Manhattan. * Sunday June 3, 2018 from 11 am - 4 pm - Israeli Celebration Parade - Along 5th Avenue between 57th Street and 74th Street - Upper East Side NYC parade Manhattan. * Sunday, June 10, 2018 from 11 am - 4 pm - Puerto Rican Day Parade & Street Festival - Along 5th Avenue from 44th Street to 79th Street on the Upper East Side. Also scroll down to section labeled Manhattan Other for Saturday street fair on 116th Street in Spanish Harlem at 3rd Avenue. * Also scroll down to the Harlem section. * Sunday, July 15, 2018 from 12 noon - 5 pm - Bastille Day Festival - Along 60th Street between Fifth Avenue and Lexington Avenue - Upper East Side Neighborhood NYC street fair Manhattan. A bit different from most others - more French. Sunday, August 21, 2016 from 11 am - 6 pm - 60th Street Festival - Along 60th Street from Madison to 5th Avenue - Upper East Side Neighborhood NYC street fair Manhattan. Sunday, September 18, 2016 from 12 noon - 5 pm - Lexington Avenue / 92nd Y Festival - Along Lexington Avenue from 79th Street to 94th Street - Upper East Side neighborhod UES NYC street fair Manhattan. 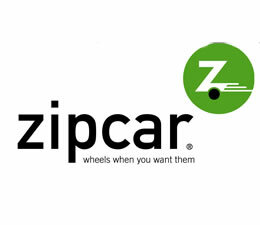 Click here to go to the Upper West Side Neighborhood UWS section of this site. Saturday, April 20, 2019 from 10 am - 6 pm - 28th Upper Broadway Spring Earth Day Festival - Along East side of Broadway from 110th Street to 116th Street on the Upper West Side UWS neighborhood in Manhattan. Sunday, April 21, 2019 from 10 am - 6 pm - Columbus Avenue Fair - Along Columbus Avenue between 66th & 72nd streets. Upper West Side street fairs. Sunday, April 28, 2019 from 10 am - 6 pm - 28th Upper West Side Spring Festival - Along East side of Broadway from 96th Street to 106th Street on the Upper West Side UWS neighborhood in Manhattan. Sunday, May 5, 2019 from 10 am - 6 pm - 31st Annual Broadway Spring Festival - Along the East side of Broadway from 86th Street to 93rd Street on the Upper West Side UWS neighborhood in Manhattan. 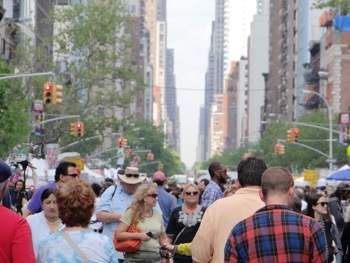 Sunday, May 12, 2019 from 10 am - 6 pm - Broadway Festival [was Columbus Circle / Lincoln Center Fair last year] - Along Broadway from 60th Street to 65th Street on the Upper West Side UWS neighborhood in Manhattan. [This street fair was DISCONTINUED in 2016] Saturday & Sunday, May 14 & 15, 2016 from 10 am - 6 pm - Crafts on Columbus Street Fair - Along Columbus Avenue from 77th Street to 81st Street on the Upper West Side UWS neighborhood in Manhattan. It's a unique street fair and a decades old UWS tradition, featuring about 100 artists & craftsmen. 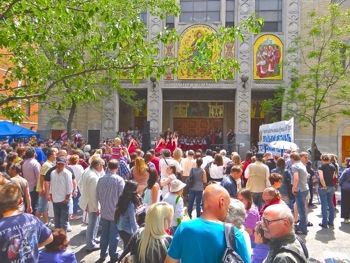 Saturday, May 18, 2019 from 11 am - 4 pm - St. John the Divine Cathedral School Spring Fair - Along the walkways leading to the Cathedral School at Amsterdam Avenue and 110th Streets on the UWS. There's an interesting tag sale where clothes and furniture and other donations made to the school are sold. Live music, grilled food and beer. It's one of the unique street fairs on the Upper West Side. Saturdays, May 2019 - The St Nicholas Avenue / Multi-Cultural Festival is being held in June - see below. * Sunday, May 20, 2018 from 10 am to 6 pm - Amsterdam Avenue Festival - Along Amsterdam Avenue between 77th & 88th Streets. By West Manhattan Chmbr Comrce. Friday, Saturday, Sunday, Monday May 2019 - Harlem Eat Up - see Harlem section below. 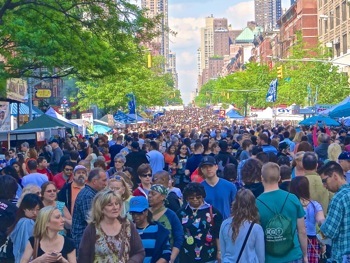 Sunday, May 26, 2019 from 10 am - 6 pm - Livable West Side Festival - Along the West side of Broadway from 72nd Street to 86th Street on the Upper West Side UWS neighborhood in Manhattan. Saturday, June 1, 2019 from 12 noon - 6 pm - St Nicholas Avenue / Multi-Cultural Festival - Along St. Nicholas Avenue from 141st to 145th Streets in Harlem / UWS - street fairs in the Upper West Side NYC neighborhood of Manhattan. Also posted in Harlem. Sunday, June 2, 2019 from 10 am - 6 pm - 26th Annual Spring Crafts Festival - Along west side of Broadway from 65th Street to 72nd Street - street fairs in the Upper West Side NYC neighborhood of Manhattan. Saturday, June 8, 2019 from 11 am - 7 pm - St Nicholas Avenue / Multi-Cultural Festival - At the Jackie Robinson Bandshell at 85 Bradhurst Avenue in Harlem - street fairs in the Upper West Side NYC neighborhood of Manhattan. Also posted in Harlem. Sunday, June 9, 2019 from 10 am to 6 pm - 42nd Plantathon Crafts Fair - Along west side of Broadway from 72nd to 86th Street - street fairs in the Upper West Side neighborhood UWS of Manhattan. One of the oldest plant fairs in the city, offering a huge array of plants, food and live music. * Saturday, June 9, 2018 from 10 am - 6 pm - Columbus Avenue Fair - Along Columbus from 97th Street to 106th Street - on the Upper West Side UWS neighborhood in Manhattan. * Sundays, June 3, 10, 17 & 24, 2018 from 10 am to 5.30 pm - Grand Bazaar NYC - at 100 W. 77th at Columbus Ave is open year round. Arts, edibles & antiques. 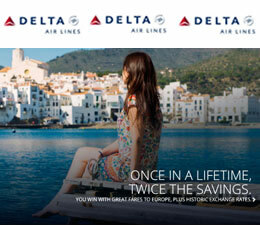 * OPEN YEAR ROUND. * Sunday, June 24, 2018 from 10 am to 6 pm - Columbus Circle / Broadway Fair - Along Broadway from 60th to 61st Street. Sunday, September 18, 2016 from 12 noon - 5 pm - Along Amsterdam from 96th to 106h Streets - Upper West Side neighborhood UWS street fair. Sunday, September 18, 2016 from 12 noon - 5 pm - Along Columbus from 68th to 86th Streets - Upper West Side neighborhood UWS street fair. 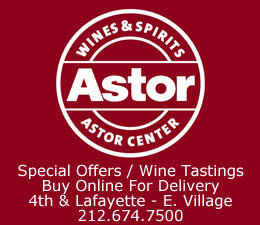 Click here to go to the West Village & East Village Neighborhood section of this site. 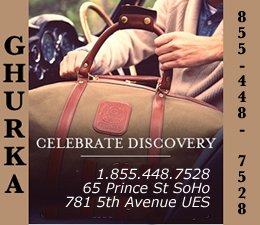 FOR LOWER EAST SIDE STREET FAIRS - Scroll down to the Tribeca, SoHo & LES section. * Saturday, March 24, 2018 from 10 am - 6 pm - Washington Place Festival - Along Washington Place between 6th Avenue & Grove Street in the Village neighborhood of Manhattan. Saturday, March 30, 2019 from 10 am - 6 pm - Astor Place Festival - Along Astor Place between Lafayette and Broadway. Street fairs in the East Village Manhattan nyc. Saturday, April 6, 2019 from 10 am - 6 pm - Washington Square Spring Fair - Along Washington Square North between 5th Avenue & MacDougal Street. St fairs in the Village neighborhood of Manhattan. Saturday, April 13, 2019 from 10 am - 6 pm - Broadway Festival - Along Broadway Street between 8th Street and 14th Street in the Village neighborhood of Manhattan. Sunday, April 14, 2019 from 10 am - 6 pm - Bleeker St Festival - Along Bleeker from Broadway to Lafayette. St fairs in the East Village neighborhood of Manhattan. Sunday, April 14, 2019 from 11 am - 5 pm - Veggie Pride Parade beginS at 12 noon at 9th Avenue and Gansevoort marching to the north end of Union Square Park where there will be speeches, performances at a festival that lasts until 5 pm. *old - Saturday, April 8, 2017 from 10 am - 6 pm - 6th Avenue Festival - Along 6th Avenue from 8th to 14th streets in the Village neighborhood of Manhattan. Saturday, May 4, 2019 from 10 am - 6 pm - Bleeker St / Pompeii Festival - Along Bleeker Street between 6th and 7th Avenues. Street fairs in the West Village neighborhood of Manhattan. *old - Saturday, May 5, 2018 from 10 am - 6 pm - Second Avenue Festival - Along Second Avenue between 4th and 14th Streets in the East Village neighborhood of Manhattan. Saturday, May 18, 2019 from 10 am - 6 pm - Astor Place Festival - Along Astor Place between Lafayette and Broadway. Street fairs in the East Village Manhattan nyc. Sunday, June 30, 2019 - Gay Pride Parade and Gay Pride fest - This is the 50th Anniversay of the Stonewall Riots in 1969, when the LGBTQ fight for rights began at the Stonewall bar and restaurant on Christopher Street in the West Village. The 8 - 9 hour long parade begins at 12 noon at 15th Street along 7th Avenue, marches south to Christopher Street where it turns heading east transitioning onto 8th Street before turning north along 5th Avenue and eventually terminating at 29th Street. Nearly 300 groups participate and hundreds of thousands come to watch. Also see Chelsea St Fairs below. * [May Not Return or Rescheduled to a Future Date] Saturday, June 3, 2017 from 10 am - 6 pm. Village Fair & Expo - Along University Place between Waverly Place and 14th Streets in the Village NYC. * Saturday, June 9, 2018 from 10 am - 6 pm - 3rd Avenue / Cooper Square Festival - Along 3rd Avenue between 6th Street & 14th Street in the Village neighborhood of Manhattan. * Saturday, June 16, 2018 from 11 am - 6 pm - P.A.L. Festival - Along University from Waverly Place to 14th Ave in the Village in Manhattan. * Saturday, June 23, 2018 at 5 pm - NYC Dyke March - Begins at Bryant Park along 42nd Street. * Sunday, June 24, 2018 from 11 am - 6 pm - Gay PrideFest - Along Hudson St between Abingdon Square and West 14th Street in the West Village neighborhood of Manhattan. ***The Gay Pride Parade begins at 12 noon at 16th Street & 7th Avenue and marches north to 5th Avenue at 29th Street. * Saturday, June 30, 2018 from 10 am - 6 pm - BAMR Bleeker Street Festival - Along Bleeker from Broadway to 6th Avenue in the West Village neighborhood of Manhattan. * old - Sunday, April 8, 2018 from 10 am - 6 pm. 6th Avenue Chelsea Festival - Along 6th Avenue between 14th & 23rd streets - street fair in the Chelsea neighborhood of Manhattan NYC. MAY - Also see Midtown & Village Neighborhood sections above for street fairs near Chelsea. * Saturday & Sunday, May 19 & 20, 2018 from 10 am - 6 pm. 9th Avenue International Food Festival - Along 9th Ave between 42nd Street & 57th Street. Click here to view a map of the 9th Ave street fair in Manhattan. * Also see in Midtown. June 2017 - Chelsea Farmers Markets open May / June. Sunday, June 30, 2019 - Gay Pride Parade and Gay Pride fest - This is the 50th Anniversay of the Stonewall Riots in 1969, when the LGBTQ fight for rights began at the Stonewall bar and restaurant on Christopher Street in the West Village. The 8 - 9 hour long parade begins at 12 noon at 15th Street along 7th Avenue, marches south to Christopher Street where it turns heading east transitioning onto 8th Street before turning north along 5th Avenue and eventually terminating at 29th Street. Nearly 300 groups participate and hundreds of thousands come to watch. Also see West Village St Fairs above. 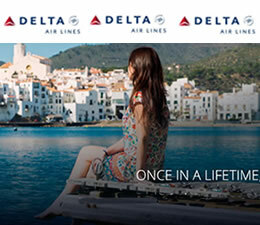 Click here to go to the SoHo Neighborhood & Tribeca Neighborhood section of this site. [Discontinued effective 2017] _ Saturday, April X, 2016 from 10 am - 6 pm - Tribeca Film Festival Street Fair For Families held its last event in April 2016 - Along Greenwich from Hubert Street to Chamber Street in the Tribeca neighborhood of Manhattan NYC. See Tribeca Film Festival for other family oriented events & programs. May 2019 - Holi Hai in NYC - as of this posting [see date at beginning of page], I haven't been able to find any CONFIRMED Holi Hai celebrations in NYC, nor any indication that the one on Governor's Island held the last two years [2017 - 2018] is going to be repeated this year. Saturday, May 18, 2019 from 10 am - 6 pm - Romania Day Festival - Along Broadway between Liberty and Battery Place. Centennial + 1 celebration of Romanian unification and culture. In 2018 the fair included 30 stands of Romanian business, restaurants and artists out of a total of 300 stands. Entertainment, food & shopping. Tribeca street fairs. *old - Monday, May 28, 2018 from 10 am - 6 pm - World Trade Center Community Fair [formerly block party] - Along Fulton Street between Broadway and Gold St. Tribeca street fairs. * Friday, June 22, 2018 from 11 am - 6 pm - NYC Police Museum Fair - Along Liberty Street from Broadway to Trinity in the Downtown NYC / Tribeca neighborhood of Manhattan. * Wednesday, July 4, 2018 from 10 am - 6 pm - Great July 4th Festival [formerly Fulton St Fair] - Along Fulton Street between Water and Gold Streets in Downtown Manhattan. * Sunday, July 12, 2018 from 12 noon - 6 pm - Liberty St Fair - On Liberty from Broadway to Trinity in the Downtown NYC / Tribeca neighborhood of Manhattan. Click - NYC Events / Manhattan Things To Do Manhattan Calendar. Click - Manhattan farmers markets. Sunday, May 5, 2019 from 12 noon - 6 pm - Cinco de Mayo Street Festival - Along 116th Street between 2nd & 3rd Avenues in Harlem. The Spanish businesses that line the street provide food, entertainment and shopping. Street fairs in Spanish Harlem, Manhattan NYC. Monday, May 13 - May 19, 2019 - Saturday & Sunday from 12.30 - 5.30 pm / Weekdays at Various Times - HARLEM EAT UP! - During the week they host paid evening events at various restaurants around Harlem. On Saturday & Sunday the events are held at Morningside Park at 112th Street and Manhattan Avenue, where the shopping market and entertainment are free, while the tasting event costs $85 to sample nearly two dozen of the best restaurants in Harlem. Harlem street fairs / food fairs in Harlem near Washington Heights. Saturday, June 1, 2019 from 12 noon - 6 pm - St Nicholas Avenue / Multi-Cultural Festival - Along St Nicholas Avenue from 141st Street to 145th Street - street fairs in the Upper West Side NYC / st fairs in Washington Heights / Harlem neighborhood of Manhattan. Also posted in Harlem. Saturday, June 8, 2019 from 11 am - 5 pm - 34nd Annual 116th Street Festival - Along 3rd Avenue from 106th St to 122nd street in the El Barrio section of East Harlem. Food, shopping & entertainment at www.116thstfestival.com. 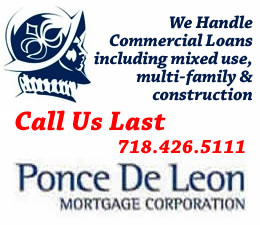 Sunday, June 9, 2019 beginning from 11 am to 5 pm - 62nd Annual Puerto Rican Day Parade in Manhattan- Along 5th Avenue from 44th Street to 79th Street. Friday, June 21, 2019 from 6 - 9 pm there's Taste of Harlem at the Union Settlement Garden at 237 East 104th Street in Spanish Harlem. Harlem street fairs in Manhattan NYC. * WEEKLY SUNDAY CONCERTS _ Sundays, July 2018 from 2 pm - 4 pm - Various - At the Charles A. Dana Discovery Center inside Central Park at 110th Street between Lenox and Fifth Avenues. Street festivals & street fairs in Harlem. You can also click this link into the Manhattan Business Directory to find local merchants and merchandise. Click here to view Bronx Street Fairs - St Fairs in the Bronx. 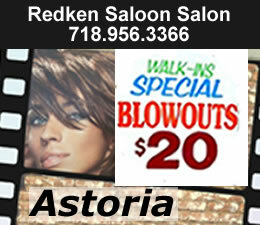 Click this link to search for something in our Manhattan Business Directory. 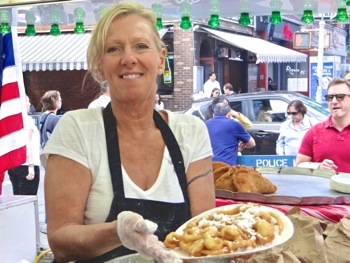 Click here to view the street fairs in Queens. 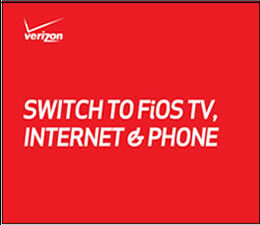 And click here to view Astoria street fairs.